This past weekend we shot our first Don’t Fear the Vegan video. The details are still a secret, though I can say we had some awesome friends that volunteered to help in exchange for free food and drinks. I can also let you know that are theme was food found at Mexican Restaurants. 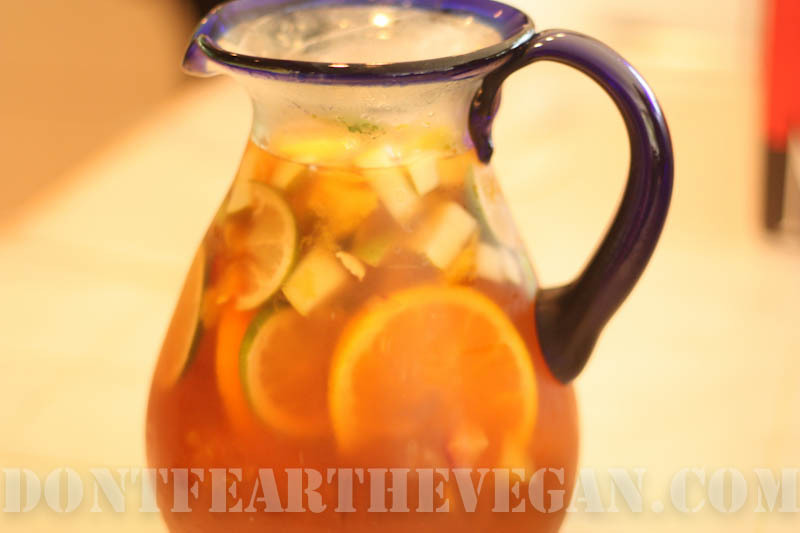 Today I am going to share the Sangria recipe we used in the shoot. In my typical fashion I had a crazy idea to switch up a traditional Sangria recipe a bit and used ginger beer instead of seltzer water. Hey, I have never claimed to be a purest. I chose Rachel’s Ginger Beer because they are a local company and it has a great lemon ginger flavor. I used the vegan wine Fetzer Gerwurztaminer with a flavor profile of tangerine, mango and clean aromas of orange spice join with pineapple, baked pears and hints of tell-tale cinnamon. I wanted a sweeter white wine to balance out the spice of the ginger. You will need to refrigerate for at least 4 hours before serving. In a small pot heat water and sugar over low heat. Stir until sugar has dissolved. Remove from heat and set aside. Put all fruit and ginger in a large pitcher. Pour wine, ginger beer, brandy, triple sec, and sugar water in. Stir. Refrigerate for a minimum of four hours. Serve.